Taipei, July 1 (CNA) The new Nangang Station on Taiwan's high-speed railway line is expected to help relieve passenger congestion at Taipei Main Station, Taiwan High Speed Corp. (THSC) Chairman Victor Liu (劉維琪) said Friday at the formal opening of the new station. Liu said the Nangang Station will absorb about one third of the high speed rail passengers that normally use Taipei Main Station, and will facilitate travel by businesspeople to Neihu Technology Park and Nangang Software Park, both of which are in Taipei City. 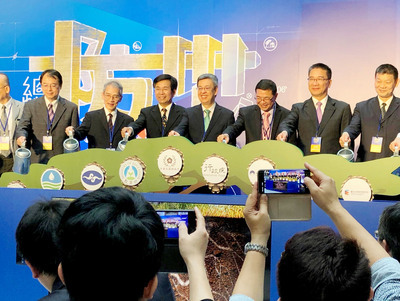 It will be a more convenient and comfortable trip for businesspeople who usually transfer at Taipei Main Station to get to the two parks, Liu said. He said the new station is now a stop for trains on the high speed railway, Taiwan Railway and the Taipei MRT. In the future, an intercity bus station will be built there, making Nangang the largest transit stop in eastern Taipei and providing more convenient transportation service to New Taipei City's Hsichi District, Keelung City to the north and Yilan County in northeastern Taiwan as well as to Neihu, Liu said. The addition of the Nangang stop brought the number of stations along the 339-kilometer north-south line high speed to 12, and it replaced Taipei Main Station as the starting point for southbound trains on the line. As part of the change, the first trains of the day on either end of the line are now departing at 6:15 a.m., instead of 6:30 a.m.
Travel time on the high speed rail from Nangang on the northern end to the southernmost station of Zouying is only 105 minutes. Vice President Chen Chien-jen (陳建仁), Vice Premier Lin Hsi-yao (林鍚耀) as well as Deputy Transportation and Communications Minister Wang Kuo-tsai (王國材) also attended the launch ceremony of the new station.